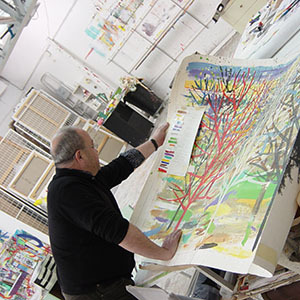 Artists such as Eduardo Arroyo, Alfonso Albacete, Rafael Canogar, Martín Chirino, Alberto Corazón,Luis Gordillo, Javier de Juan, Jordi Teixidor, Mitsuo Miura, Willy Ramos, Manolo Valdés have worked in our Atelier their limited edition prints. 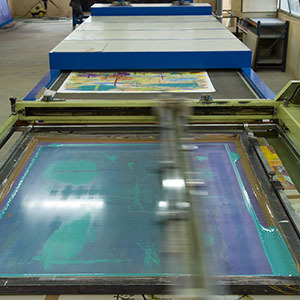 Fine Art Printing includes assorted techniques > -such as silkscreen printing, lithography, engraving , woodwork printing etc. Hand made printing or Fine Art Prints involve the artist and are not reproduction and allow artists to be experimental in their work, as numerous processes can be used to achieve a variety of finished effects. 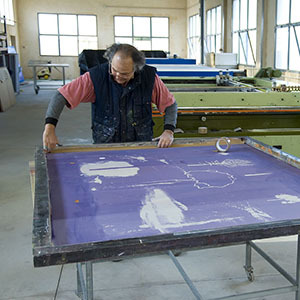 In our silkscreen Atelier, we want the artist to be involved in the whole process, while a master in the technique help them achieve the best of it while using the possible effects. In the Third International Congress of Plastic Arts that took place in Wien 1960, it was stablished the definition of ORIGINAL WORKS OF GRAPHIC ARTS orORIGINAL PRINTS. 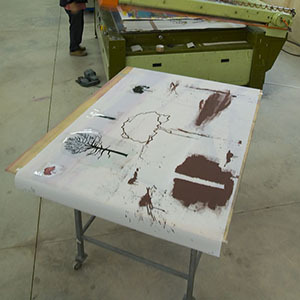 The artist has to be directly involve in the process of printmaking. The printing itself can be made by the artist or other person. If the printing is done by other person (not the artist) he/she should sign in the left side of the artwork (print) as ‘printer’. Once the limited edition is finished, the plaque or screen can’t be used again and should be destroyed. The tests during printing shouldn’t be including in the numbering and must be signed as Author proof or Atelier Proof. Author or Atelier proof shouldn’t be more than 10% of the total run. 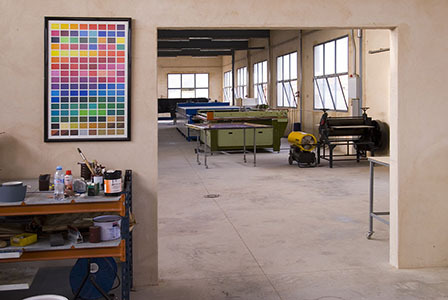 Our Atelier, directed by master in Silkscreen Art with over forty years experience in the technique –and knowledge of the multiple effects that silk-screening can bring-, and is equipped with state of the art technology. 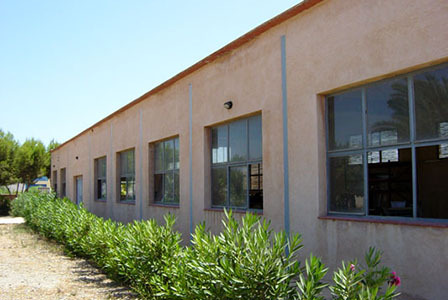 The Atelier is located in the country side of a Mediterranean location, surrounded by lemon trees and palm trees. Our Gallery is located near the Atelier, and is a rehabilitated Hermitage from 1800, an open space with skylight where we exhibit our best Limited Edition Prints and some Fine Art from the artist working with us. 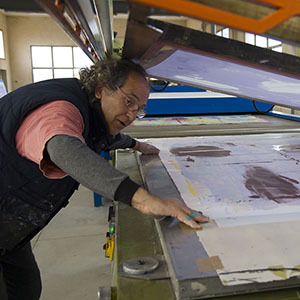 Limited editions of silkscreen prints, Atelier directed by a master in the technique with over forty years experience. Alfonso Albacete, Antonio Alcaraz, Mercedes Alberdi, Eduardo Arroyo, Manuel Avellaneda, Antonio Ballester, Manuel Barnuevo, Manuel Belzunce, José L. Cacho, Antonio Campillo, Rafael Canogar, Ricardo Cárdenas, Dora Catalineu, Ceesepe (Carlos Sánchez Pérez), Ángel Mateo Charris, Martín Chirino, Alberto Corazón, Javier de Juan, Juana de Juan, Ángel Fernández Saura, Miguel Fructuoso, Jorge Fin, Ricardo Galindo, Noelia García, Juan Gomila, Luis Gordillo, Ángel Haro, Pablo Lambertos, María Lara, Esteban Linares, José Lucas, Alicia Martín, Antonio Martínez Mengual, Jalid Melloul, Lola Montalbán, Mitsuo Miura, Muher, Muñoz Barberán, David Murcia, Marina Núñez, Emilio Pascual, Aurelio Pérez, Manuel Pérez,Vicente Ruiz, Javier Seco, Manuel Sáez, Jordi Teixidor, Manolo Valdés. Ediciones agotadas: Arty Grimm,Barbara Eichorn, Juan Genovés, Florencio Gelabert, Ramón Gaya, José Mª Yturralde.